The D16 is 1.6-liters four-cylinder D-series engine. The most mass production engine is the D16A. This engine is a ubiquitous engine for Civic model as well as the smaller D15B engine. The D16 engine is very similar to the D15. The D16 shares the same cylinder bore, but it has a more significant stroke to reach more displacement. In this case, the D16 got its aluminum cylinder block, which is taller by 4.5 mm (212 mm). The engine has only 16 valve head versions, but they can be SOHC and DOHC. Also, the manufacturer produced the VTEC engines and non-VTEC engines. Like in the D15, there are camshafts driven by timing belt. The engine doesn't have hydraulic lifters. The adjustment is required every 25,000 miles (40,000 km). The engine through the history got many modifications listed below. There is nothing new compared to the D15 engine. Crankshaft pulley brakes, exhaust manifolds cracks, distributor, etc. A detailed description is on the D15 engine review page. The engine life of the D16A is just a little bit longer - 180,000 miles (300,000 km). But you are lucky if you will find an engine with small mileage in our day. 1. D16A1 - the first engine, 16-valve DOHC head, 30 mm intake valves, 27 mm - exhaust, compression ratio is 9.3, the power of 115 hp. From 1988 the engine got new piston, the compression ratio was increased to 9.5 and power grown to 120 hp. The production began in 1986 for Acura Integra on the US market and stopped in 1989. 2. D16A3 - the D16A1 for Australian Acura Integra. 3. 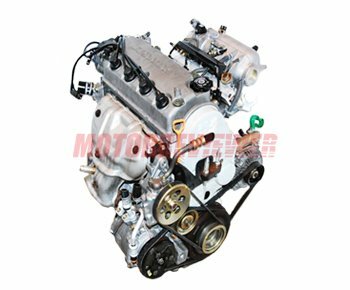 D16A6 - 16 valve engine with SOHC cylinder head, camshaft duration is 222/224 deg, 29 mm diameter of intake valve, exhaust -25 mm, 9.1 compression ratio, fuel nozzles are 235 cc, power is 107-110 hp. Production years are 1988-1996. 4. D16A7 - D16A6 without a catalytic converter, 9.6 compression ratio, the power is 119 hp. Production: 1988-1995. 5. D16A8 - 16 valve DOHC head, 9.5 compression ratio, the power is 120 hp. Production: 1988-1997. 6. D16A9 - analog of D16A8 without a catalytic converter, 126-130 hp. Production: 1988-1995. 7. D16B2 - 16 valve engine with SOHC head, 9.4 compression ratio, fuel nozzles is 190 cc, 115 hp. Production: 1997-2001. 8. D16B5 - SOHC 16 valve engine with 12.5:1 compression ratio. The engine has VTEC-E system. Its power is 106 hp. The D16B5 was being produced from 1988 to 1996. 9. D16B6 - 16 valve SOHC, 9.6 compression ratio, 114 hp. Produced only in 1999. 10. D16V1 - this engine was for European Civic model. Specs: 16 valves SOHC head, VTEC-E, 10.4 compression ratio, 109 hp. Production: 1999-2005. 11. D16W1 - 16 valve SOHC engine, 9.6 compression ratio. It makes 103 hp. Applications: 1999-2006 Honda HRV. 12. D16W3 - 16V SOHC, 10.4 compression ratio. Engine power is 116 hp. This modification was being produced since 1998 to 2001. 13. D16W4 - 16V SOHC, VTEC, 9.6 compression ratio, 190 cc fuel nozzles, 125 hp. Production: 1998-2001. 14. D16W5 - the same D16W4 but with VTEC-E system. Power is 124 hp. It was being produced from 2000 to 2006 and installed in Honda HRV. 15. D16W7 - SOHC head, VTEC-E, 10.9 compression ratio, 115 hp. Production: 2001-2007. 16. D16W9 - the engine got 3-Stage VTEC. It produced 130 hp. 2001-2005. 17. D16Y1 - SOHC VTEC, 9.3 compression ratio, 131 hp. 1992-1995. 18. D16Y3 - SOHC head with camshaft installed from D16A6, 9.4 CR and 113 hp. It was being produced from 1995 to 1997. 19. D16Y4 - analog of D15Y3, but it had another camshaft. 1996-2000. 20. D16Y5 - analog of D16Y3 equipped with VTEC-E system, the intake valves diameter is 30 mm, 26 mm - exhaust, 190 cc fuel nozzles, the power is 115 hp. The VTi version produced 127 hp. Production: 1996-2000. 21. D16Y7 - 180 cc fuel nozzles, 107 hp. Production: 1996-2000. 22. D16Y8 (D16Y6) - SOHC VTEC, camshaft duration is 246/230 deg, diameter of intake valves is 30 mm, exhaust - 26 mm, new pistons, compression ratio is 9.6, 240 cc nozzles, the power is 127 hp. Production years: 1996-2000. 23. D16Y9 - D16Y4 with new camshaft, power range is 107-111 hp. Production: 1996-2000. 24. D16Z5 - analog of D16A9 with a catalytic converter produced 124 hp. Production: 1989-1992. 25. D16Z6 - SOHC VTEC, camshaft duration is 244/228, 9.2 compression ratio, 235 cc fuel nozzles, 125 hp. Production: 1992-1996. 26. D16Z7 - analog of D16Z6 with a compression ratio 9.6:1. The power is 127 hp. It was being produced from 1996 to 2000. 27. D16Z9 - SOHC VTEC, 9.3 CR, 130 hp. Production: 1994-1995. 28. SOHC ZC - VTEC, 9.2 compression ratio, 130 hp. It was being produced from 1991 to 1995. 29. DOHC ZC - twin cam cylinder head, the compression ratio is 9.3 (9.5 since 1988), 100 hp with carburetor and 115-130 hp with fuel injection. It was being produced from 1984 to 1995.